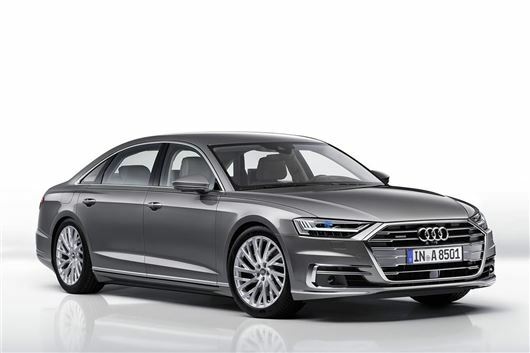 Audi has its all-new A8 on display at the 2017 Frankfurt Motor Show. The technology-packed luxury flagship is larger than its predecessor and will be arriving on UK roads in late 2017. It will have a fully-autonomous driving system for traffic jams, enabling the driver to take their hands of the wheel.The system, called Audi AI, works on two-lane roads where there is a barrier separating the flow of oncoming traffic. At speeds of up to 37mph it will control braking, throttle and steering, enabling the driver to completely remove their hands from the wheel until prompted by the car to retake control. Autonomous driving isn’t the only fancy next-gen tech on the new A8. Active suspension can independently raise and lower individual wheels, giving impeccable ride quality over rough road surfaces and potholes, without overly soft, wallowy handling. All-wheel steering is available too, to provide better agility in bends or when manoeuvring. Initially there are three engines – a 3.0-litre V6 TDI diesel and a 3.0 V6 TFSI petrol. A V8 diesel will arrive later, plus there is a 6.0-litre W12 in top models. All engines come with a 48-volt mild hybrid system to provide energy recuperation and smooth coasting. An E-tron version will be available too, using a 3.0-litre petrol engine linked to plug-in hybrid system. Range on pure electric is 31 miles with a full battery. The battery itself will be available with a wireless charging system eventually, using a charging pad fitted in a garage floor.